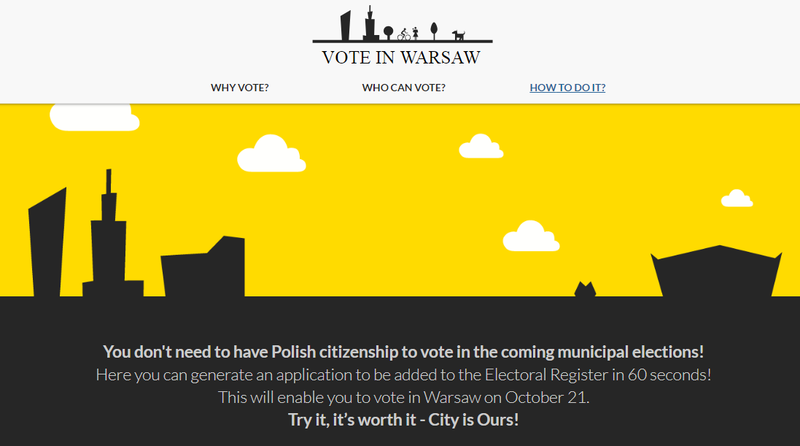 Vote in Warsaw for local city activists! „City is Ours – City Movements electoral list” (KWW Miasto Jest Nasze – Ruchy Miejskie) is an independent, progressive citizen platform and a coalition of 12 local grass-root movements representing 16 districts of Warsaw. We are not affiliated with any political party. We want to live in a walkable, green, friendly, clean, tolerant, healthy and people-oriented city of Warsaw. We are progressive activists who share a „cityology” not an ideology. We run in the municipal elections to overthrow the corrupted political parties which do not care for Warsaw, but follow their political agenda. Open, tolerant and friendly European city attracting talented people from the whole world. More greenery! Less concrete and asphalt! Priority for public transportation. Less cars. We want to breathe! We will fight air pollution, because Warsaw’s smog is a serious health risk. We will fight trash-burning etc. if Copenhagen and Amsterdam can, why can’t Warsaw? new construction projects of the city public and social housing. We will break developers’ monopoly. public, affordable and available child care facilities. Justyna Glusman graduated from the Warsaw School of Economics and the London School of Economics and Political Science, where she completed her PhD in the field of political economy. She has experience in working for the local government, public administration, as well as for the private sector. In 2012, she took part in the Presidential Experts’ Program dedicated for young scientists in the Chancellery of the President of the Republic of Poland. She teaches city management and urban policy at the Warsaw School of Economics post-graduate studies. Her husband was born in Argentina, they live in Ochota district with their three daughters..